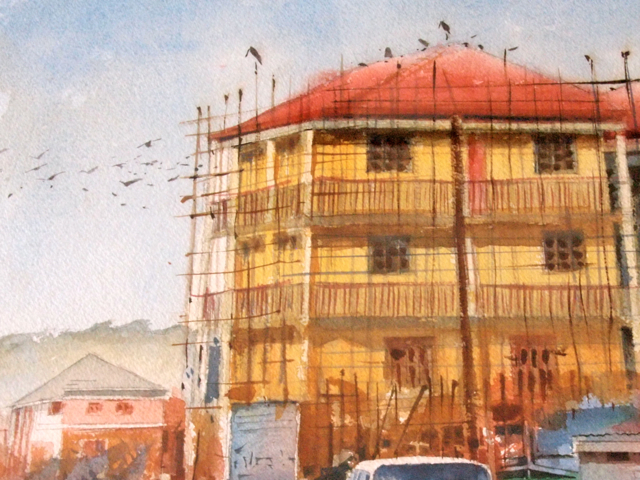 In “Changing Kampala”, a four-storey building, still under construction, gleams in the morning light. The golden building, encapsulated in wooden scaffolds and guarded by marabou storks, looks like a giant compared to its lowrise neighbours. Two vehicles with ribbons of blue-and-white squares in a rather empty street, bear evidence of this morning scene taking place in Uganda. 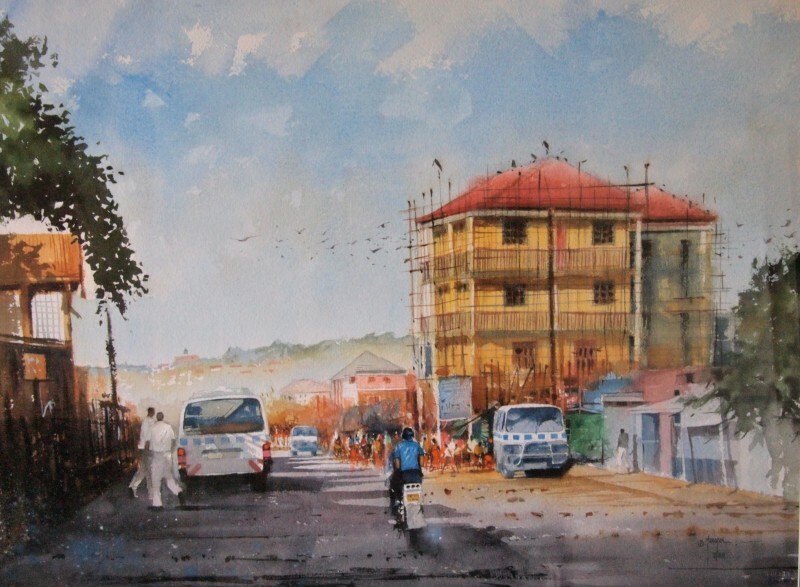 The Ugandan visual artist Taga Francis Nuwagaba has not long ago completed his watercolour piece ’Changing Kampala’. It has been framed and put on his desk in his studio in Bukoto. The artwork is part of an ongoing series of cityscapes. 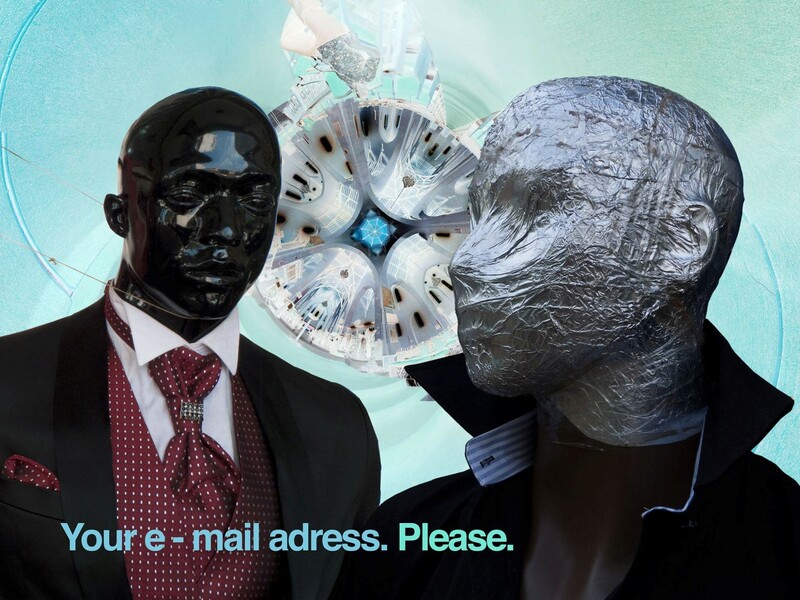 In this new category of articles, Startjournal.org will present the Story Behind an Artwork. We will be interviewing leading East African visual artists about one particular work of art, and trying to explain the artists’ reasons for and struggles with creating that one piece of art. Start: Why did you paint this particular painting? Taga: Kampala is changing as a city. Every year we are witnessing new, tall buildings coming up from the slums. To capture the spirit of today, I was almost forced to make a painting like this, so that our children in ten-twenty years time will see how the town was before it changed. Start: How and why did you choose this specific location? Taga: What I normally do is to drive around town to identify an area I want to capture. This motif is a real place on Gayaza Road, when approaching the Kaleerwe market. I chose this location because of the impending building, shooting up. As you can see it is still under construction. And that is a symbol of hope. Hope for this country. I would like to paint more and more of my city as it is growing and changing. An artist has an obligation to do so for the future generation. You want to capture those moments that were there, good or bad. Start: Why is that important? Taga: It is part of our history. And I do believe in history. When you plan for the future, it is important to know that you came from somewhere. When you look at this picture in the future, the place may have changed, maybe it has become a better place and you will think ’Oh, it has been a long walk’. I think every city needs a history [depicted in paintings]. Start: You mentioned hope; is that the most important message in this painting? Start: What do you mean by that? Taga: Imagine singing a song; the message might be very important, but if you don’t hit the right tone or the right beat, the message is as good as nothing. As a visual artist it comes down to your command on the medium. In my case; how are my abilities to manage watercolor. Start: What do you feel were the challenging parts to command in this piece? Taga: Often, the strenuous part is the areas which are not done. 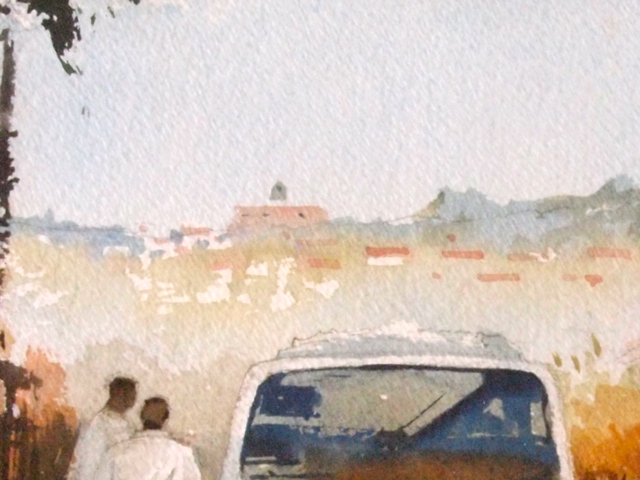 In watercolor, the idea is ’less is more’. For example here, you may note the buildings on the Makerere hill in the background, but when you actually take a good look – it is just a sweep of the brush. And here, this boda driver: He plays an important role, because he informs you that the impressionistic stick figures he is approaching are actually human beings. Both the crowd and the buildings in the background hill are simplified to help the viewer pay attention to the one major area; the building. It is the building which is supposed to capture and take command over the whole piece. The less is more-approach is a good way of capturing the story, because you do not strain the eye of the viewer. It becomes easier to see than if you have to do every single dot. Start: Would you tell us a little bit about your process of making a painting like this? Taga: As I mentioned, first I drive around to identify the place of interest. I sit in my car and make a sketch and develop some of the ideas I want to emphasize. Then I take some additional photos because I finish the painting in the studio. There is usually one major thing – one dominant feature – I want to use in the painting. Once I know what that is going to be – a building, a tree, an ant hill, whatever – I use the rest of the other objects as simple instruments to help me finish the story. Start: Do you always start to create that one major thing? Taga: Sometimes, but not necessarily. Once I get my area of interest, I need to develop the smaller things. It is like being a powerful man: A powerful man needs its people, you can not be powerful without other people. So in this case, this building only looks dominant when surrounded by smaller ones. Start: How precise are you in depicting the different elements? 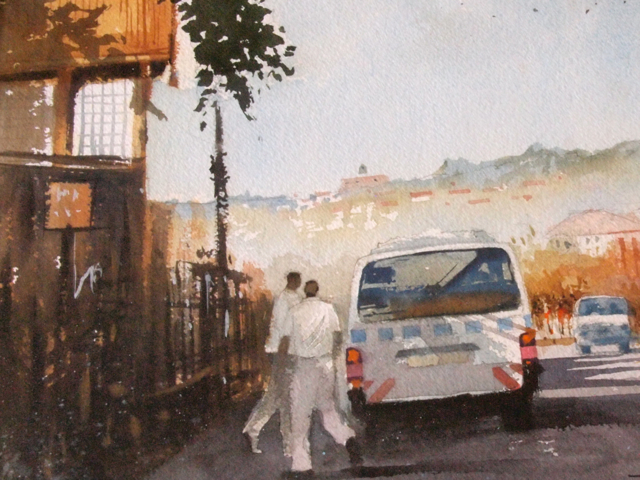 Taga: When I am doing landscapes or cityscapes, I don’t do them with photographic precision. I am not a camera. I choose things I feel are interesting to my eye, which hopefully also are interesting to other viewers. I would never paint leaf by leaf, or tree by tree. I always edit. And that is the purpose of art; to create new ideas, to bringe change to you, to change and play with things. In this painting, I started out by doing the main building, next some elements in the background, and then the buildings on the left by creating their vertical line. After that, the rest of the objects were creatively inserted. Start: The vehicles, the people moving, the crowd … do they need to have a purpose in this picture, in the story? Taga: Well, actually most of these objects are there to help me give my painting depth. This use of perspective, which is an illusion on a flat format of course, gives a sense of reality. Together with the objects in movement, like the boda boda, the two persons in white near the matatu, the man on the pavement, the crowd of students at the corner of the building, the flying birds – they are all in the image to give a sense of movement. The city is not static. Kampala is changing. Start: And the guarding marabou storks, are they symbolic in any ways? Taga: You can not talk about Kampala without mentioning those birds. Even though people hate them. I think the Marabou storks are the landlords of the city, nobody knows the city better than them. Even though they were not present when I visited the place, I had to include them. 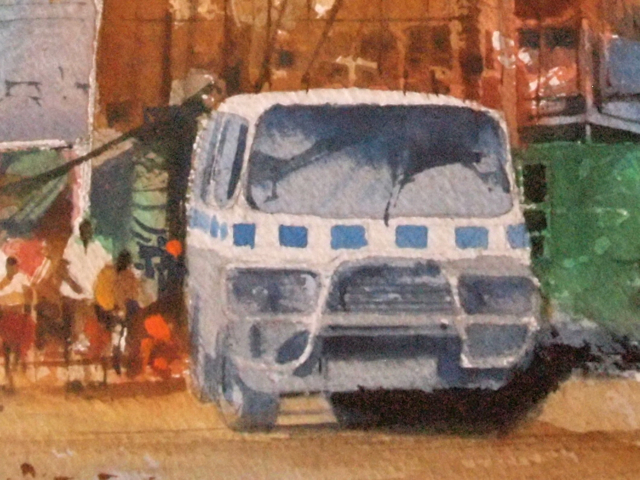 It is a little bit like including the boda boda and the matatus in the street scene. If you visit Kampala you are struck by those two means of transport. But once again, this story is not about boda bodas and matatus. Or people. It is about the rising buildings. Start: The scene might look more appealing, more organized, and more pleasant maybe to the eye than the actual street would be. What kind of artistic liberties do you normally take? Taga: I have tried to capture the spirit as much as I possibly can, but at the same time I must create something new. So I deliberately cut out a possible crowd from the foreground. Instead I have a lot of emptiness around the objects; the sky, the road, the empty pavement. By doing so, I am trying to give the motives a sense of breath. Start: You mentioned ’being in command of the medium’ as one important message behind your work. 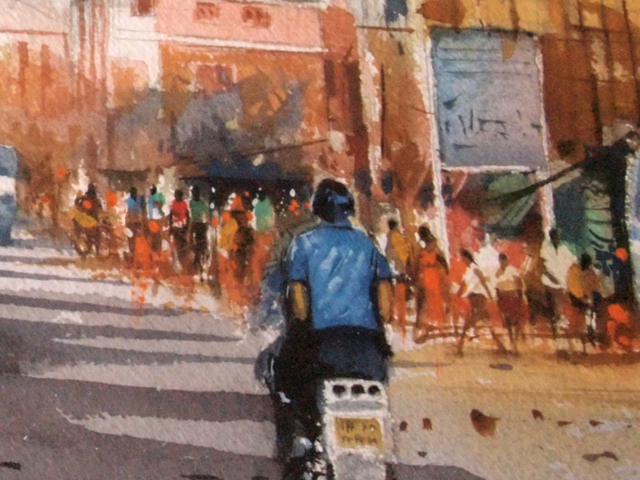 What is especially challenging when trying to master the art of watercolor painting? 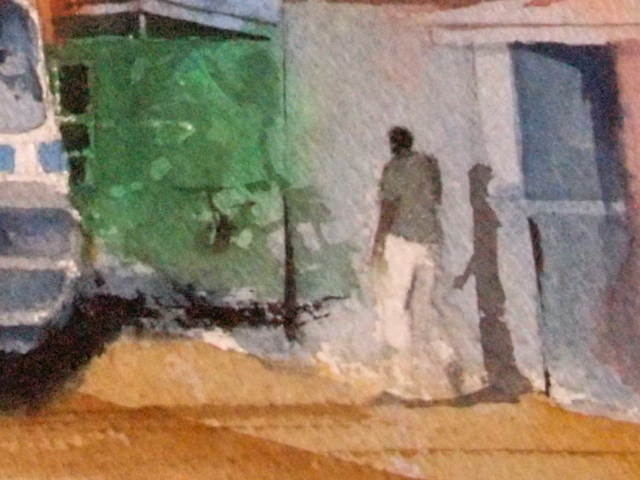 Taga: Watercolor is one of the hardest visual media, and many artists would stay away from it. Mainly because there are too many negative surprises. The main reason for why it is tricky, is because you are working on a wet surface, so the colors are always moving. Sometimes you don’t know what a blob of color is going to do when you apply it. In this one, there were some elements that surprised me. When I was working in this area from the matatu via the crowd to the building, I thought I was going to spend longer time working on it. And I was also surprised by the way the lightning came into the image. It has taken me a long time to get to my current level as a watercolor painter. And I am still trying to understand this medium. 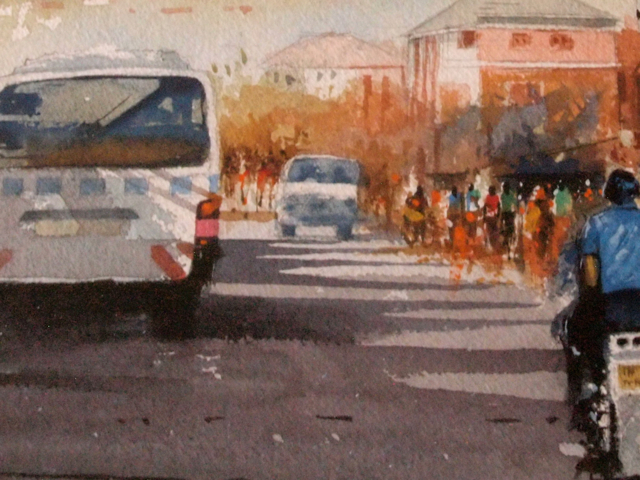 Artist profile: Taga Francis Nuwagaba has a BA in Fine Arts from Makerere University. 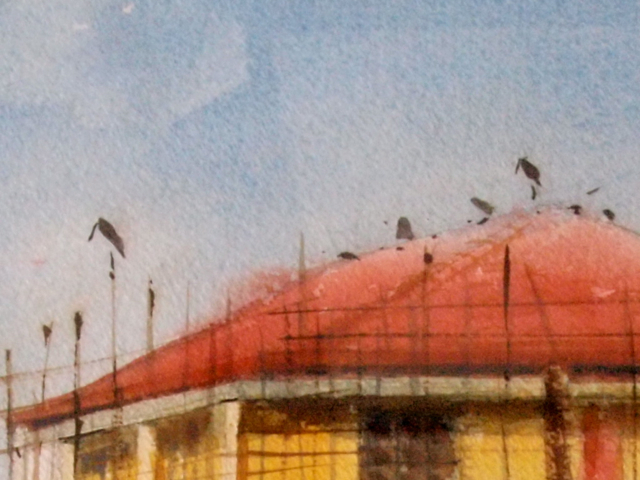 After completing his degree in 1990, Taga embarked on his career and has painted since using watercolor and oil. His favourite subject has always been wildlife and the human figure. Great work Taga!!!! Nice story.